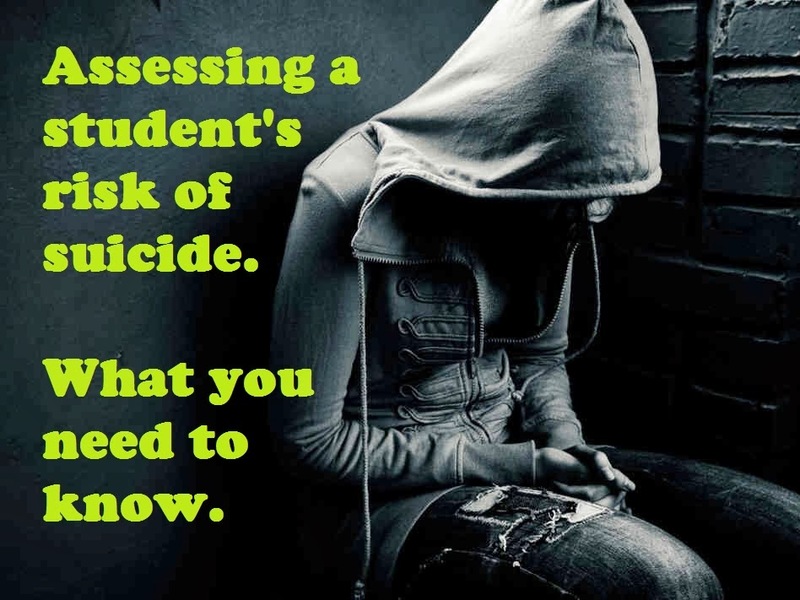 Suicide Assessment: Do you have the right tools? Our mental health team is working hard to put together a crisis response program. 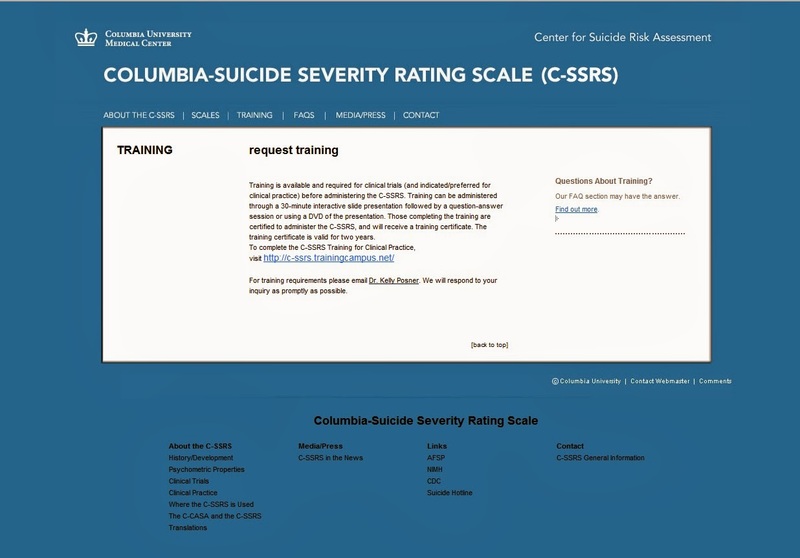 As part of this, we have decided to all get trained to administer the COLUMBIA-SUICIDE SEVERITY RATING SCALE (C-SSRS). I was amazed at how much I learned in one 30 minute web-training. The nice part is that it's available to anyone and is free! What do you do when a student comes into your office saying they cut himself/herself last night? What do you do when they tell you they took a bunch of their mom's pills? You need a plan for response. Over the 21 years I have been a counselor, I have had many students seek me out with these situations. It is sad t say that up until now, we have had no formal rating scale to use with students to determine their level of crisis. 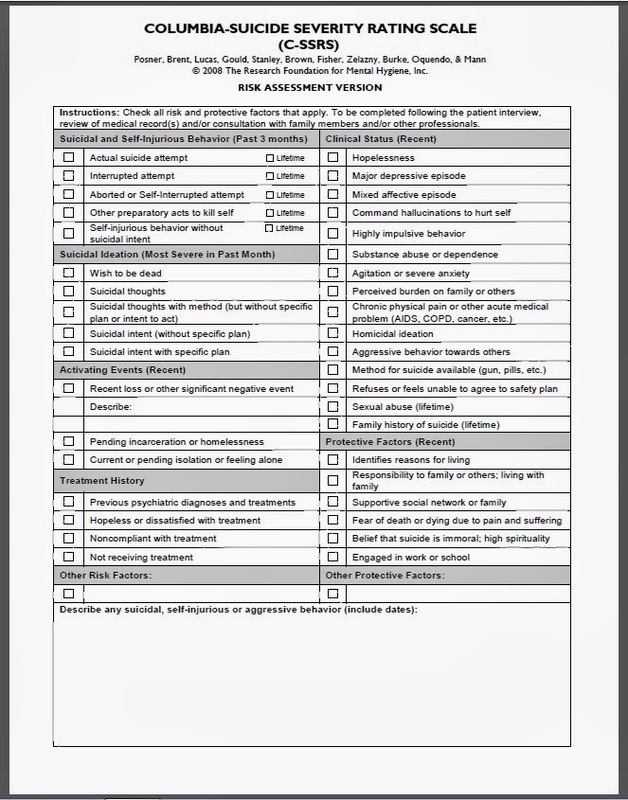 While I am still no expert, I do feel comfortable in using this assessment as a starting point for further referral. The training also has several case studies to help explain the difference between what is and what is not a suicide attempt. If you are a counselor working with students, this is a good training to help with your school's own crisis response protocol. Below you will find a picture of the website with links to the training. You will also see my completion certificate and the rating scale. While I hope that I never have to use this, I know we are are prepared. I want to add that in our district we would do this as a team with another counselor for collaboration and consultation. Never go solo in a crisis situation. Always have backup. I hope to post more about our crisis plan, but for now it is still a work in progress. In the meantime, how prepared is your school? What procedures do you have in place? Thanks for the link Carol!! Thank you Kayela! I really like your blog and am honored that you shared this post with your readers. It really is a great resource for any school putting together a crisis response plan. Thank you so much for this! Do you mind if I share your blog post? Despite the chaos of my first year as a K-12 counselor, this was an easy and informative web training for me to complete. Thanks so much for sharing. How did you get the certificate? I completed the assessment at the end of the module, but then it told me to click Exit and that was it. Also, would you use the pediatric version for middle and/or high school students? Or the standard version for 16+, something like that? Thanks for maintaining your blog -- it has been a helpful resource for me this year.